This session will explore the potential risks in using social networking and user-generated content for marketing campaigns, and will give practical suggestions to help marketers campaigns succeed. In advance of the Startup Mixology Conference on June 16th 2011 Frank Gruber the Founder of Tech Cocktail appeared on MyFoxDC today. Listen to his take on the hot startups in the DC area. Today I was at the Internet Week New York 2011 speaking on a panel " Manage your Domain": organized by the dynamic folks at @dotco. The Internet Week events take place at several places around New York City and our panel was at the Metro Pavilion, (125 W. 18th Street, New York City). Details of the panel and my fellow panelists below. Social Vending Machine from Pepsi - I did not try this but it seems like you can send a drink to a friend using this machine. Lori Anne Wardi brings close to 20 years of diverse business experience to her position as Director of Global Communications at .CO Internet. Prior to joining .CO Internet, Ms. Wardi founded and managed several businesses, including Dream Big Media, Inc., a digital asset strategy consulting firm in New York City. Previously Ms. Wardi practiced law for five years at Proskauer LLP, a top tier national law firm, where she counseled executives on the full gamut of federal and state employment laws. A seasoned management consultant, Ms. Wardi has served as the Global Manager of Training and Professional Development for the Technology Division of Goldman Sachs; and has consulted with executives in many of the world's most prominent investment banks, professional service firms and non-profit organizations, including JP Morgan Chase, UBS, and AIG. Ms. Wardi has a B.A. in International Relations from Muhlenberg College; a Master's Degree in Human Resources from Cornell University; and a Law Degree from Brooklyn Law School. Lester is a Wall Street veteran with decades of experience in all facets of the micro and mid-cap equity markets. During his career he has been instrumental in financing many companies both privately and publicly. Lester truly understands the needs of a company looking for recognition in the public marketplace. Prior to joining Cameron, he spent 38 years in the investment banking and brokerage business, including a 17 year tenure as CEO of Rosenkrantz Lyon & Ross, Incorporated, a NYSE-member firm. As a banker, Lester garnered in-depth experience in representing companies and their management as they interacted with their boards of directors, investment bankers, syndicate managers, analysts, retail and institutional brokers, as well as attorneys and accountants. Lester graduated from Pennsylvania State University with a B.S. in Business Administration. He is the author of the following articles, which have appeared in ValueRich Magazine: "What Makes a Good Company.GREAT?" and "Don't Forget the 'Public' in Public Company." Neil is the founder of LoadOut and has assembled a team of 20 young people representing four countries who are passionate about advancing technology within the global agricultural sector to help facilitate greater efficiencies and improve the way people produce food. Besides working to pioneer LoadOut's solutions, you can find Neil laboring on his family’s farm in Central Indiana (possibly driving a semi-truck). Neil generally dedicates a full day’s work on the family farm: starting from the ground up doing the hard work like many other young farmers across the country. In his spare time Neil enjoys striving to encourage international agricultural collaboration between businesses, universities, and citizens. When time permits, he invites foreign students, businesses, and educators from across the globe out to the farm for dinner and neutral discussion in an attempt to bring people together in ways that normally would not be possible. Donate $5 and show your support with a Blue Key pin or pendant. Reachout and spread the word on Facebook or on Twitter using the #bluekey hashtag. This video of the recent crisis in Libya and how it leads to hardship to fellow human beings. Among all the things that you can do with your iPad, here is one app that can likely help you try acupressure. 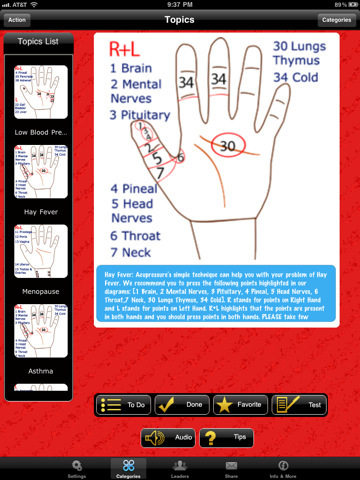 The app is called AcuPressure Doctor for iPad ( also available on an iPhone and android) and is created by a friend of mine Shiv Verma. Shiv tells me that his app is now top app in the medical category of the iPad app store. The app that costs 99 cents and hope you have fun if you decide to try it. Let me know what you think . I have it on my android and will be trying at home today.